Vanessa Bradford, Partner from Fine & Country Droitwich Spa visited St Paul’s Hostel in Worcester, on Tuesday 5th February 2019. Vanessa nominated the charity for our autumn grant programme and they received £700. Take a look to see what happened at Vanessa’s visit. Vanessa said: “It was an amazing experience. I had a full insight into how St Paul’s Hostel functions. They work with their clients to learn about their past experiences. Most of them have experienced trauma situations, such as: sexual abuse, emotional abuse and domestic violence. “By getting to know each client and understanding their history, the team at St Paul’s Hostel can tailor their support to help their service users get off the streets in both the short term and permanently. “They have a counsellor who works with them and they include residents in chores and duties such as, gardening and cleaning to give them responsibility, structure and improve their mental well-being. 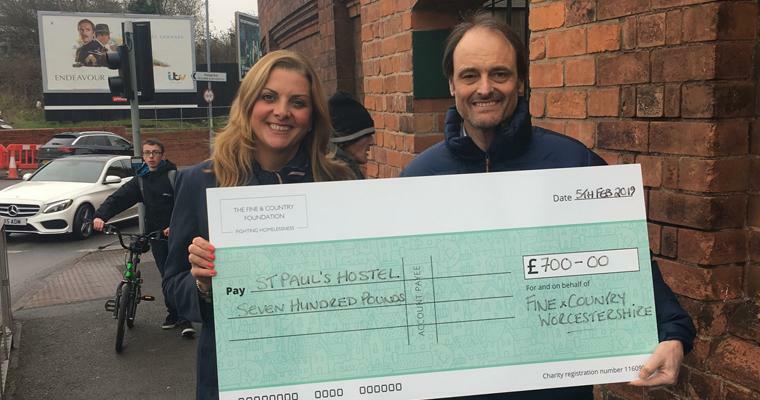 St Paul’s Hostel was one of 14 homeless charities to receive a grant from The Foundation’s autumn programme. Their £700 grant has funded their new Audio Visual (AV) equipment to enable digital skills education in small groups. Many of their clients have never used computers and some are illiterate. The AV project is designed to encourage learning in a friendly and inclusive environment. Clients can develop and refine their skills, improve their CV and confidence and work their way to employment and self-fulfilment. The work of St Paul’s has not gone unnoticed by the local community. Police callouts have reduced from 208 in 2013, to 87 in 2017. The experiences of residents at St Paul’s Hostel is not uncommon. To request support and funding from The Fine & Country Foundation for your homeless community, please contact foundation@fineandcountry.com.